Ready to learn? Join us today and get certified! This course is not just focused on postpartum timelines, limitations and special considerations, you will learn the exact corrective exercises needed to progress a postpartum client with Pelvic Floor Dysfunction (leaks, tightness, and prolapse), Diastasis Recti, SI Joint Pain, and Low Back Pain back into high-intensity exercise. What does this program offer Personal Trainers, Pilates Instructions, Yoga Teachers and other Wellness Professionals? It bridges the gap between training and rehab. This course will give you a deeper understanding behind the common postpartum dysfunctions and the best corrective exercises to help. You will gain confidence in your programming that you are making the best choices in the face of difficult issues. On top of this, you’ll take away hundreds of exercise progressions, regressions, and variations to help fit any client at any level. This course is not just theory, it’s also a great deal of practical application. You will become a gate keeper of knowledge and a trusted advisor and resource for your clients, knowing where and when to refer them to maximize recovery, while still working to improve things on your end. Sarah’s knowledge of the body never ceases to amaze me. She was able to instruct about the pelvic floor in a way that I will be able to translate easily to many of my clients in a personal training setting, enabling them to be more effective in their workouts. Without fundamentals such as this, gross motor patterns are not nearly as effective and may eventually result in injury and imbalances. What does this program offer Physical Therapist, Chiropractors, and other healthcare professionals? You will learn the best corrective exercises that go way beyond clams, bridges and planks to use for improving alignment, strength and finding the source of the problem. On top of that, you will gain a working knowledge of the small tweaks needed to make each individual exercise more effective. The significant number of case studies, progressions and regressions will leave you confident in your exercise prescription for any level client, from beginner to advanced athlete. Dr. Sarah also pulls from a lot of different perspectives, many tools in the toolbox so to speak, so you’ll get a wide range of approaches and develop a great appreciation for the big picture and whole body holistic approach. Leave with the why! This course explains why a woman only three months postpartum can run without consequence while another woman ten months postpartum gets prolapse from lifting a stroller wrong. You will learn why SI Joint pain happens. Why a diastasis heals quickly for some and not for others and what you can do about it. The goal is for you to take away the rhyme and reason behind it all. To truly understand the cause. Through this course, you will be prepared to assess and adapt. You’ll get women with prolapse running and maxing out on lifts. You’ll learn fast effective exercises for addressing a diastasis. You’ll get quick tips to immediately relieve an achy back, but more importantly, you’ll learn why it was achy in the first place, so it will never happen again. No more band-aids! No more piecing things together to try and make them work. You’ll be helping women from the inside out to build an unstoppable body that can handle anything they want to throw at it. “As a Physical Therapist and personal trainer, I can tell you that Sarah has created THE BEST training program for women. Hands down! After I had my baby I thought getting back into shape would be easy, especially given my professional background. Between taking care of my baby and running my business, I had no time to workout and I let my body get weak. I soon developed prolapse and a diastasis. I immediately went into complete panic mode and turned to Sarah for help! Her knowledge alone is mind blowing. Couple that with her passion for helping women and her compassion for what we are going through and it’s simply more than anyone could ask for in a therapist. Actually, that’s not true. We should all strive to be like Sarah. Her programs work! I recommend my OWN patients invest in Sarah’s programs because her work is so tailored, specific and easy to follow. In this course, you will learn what makes these programs so effective and exactly what exercises Dr. Sarah is using to get fast results for hundreds of women all over the world. Learn from one of the leading Physical Therapist in the field of postpartum rehab and fitness. Dr. Sarah has over 15 years of experience with extensive training in ortho and women’s health. Set your own study schedule. Each week a new series of lessons will appear in your account, view them whenever is most convenient for you. If you have a busy week, no problem, just catch up when it’s convenient for you. It’s a self-paced learning style. 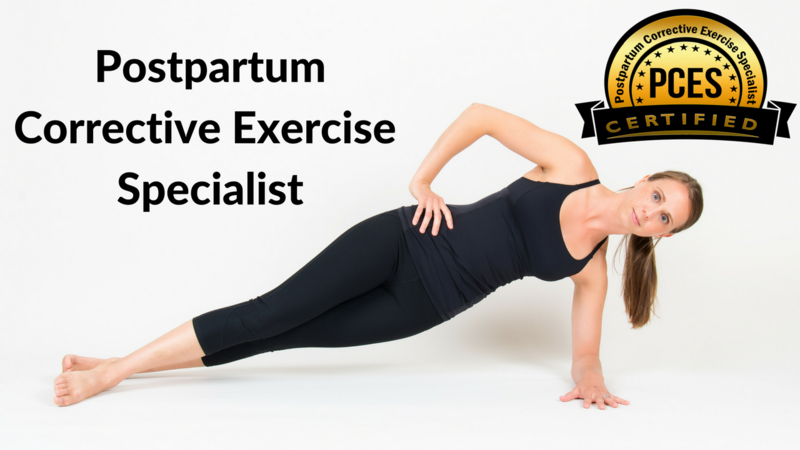 After the full course, you’ll become a certified postpartum corrective exercise specialist. This course is backed by evidence and clinical experience with a cutting edge whole body approach to recovery. This course can travel anywhere your laptop or tablet can. It’s open to participants in any part of the world. After completion of the course, your name will be added to a directory so new clients can easily locate you. Learn how to market yourself as a Postpartum Specialist and gain insight on how to best grow your business and attract the clientele you’re looking for. Learn from the best in business with guest lectures from other experts in the postpartum field. Dr. Sarah has rehabbed hundreds of women with pelvic floor issues, diastasis recti, SI joint dysfunction and low back pain. With a doctorate and over 15 years of experience in the health and wellness field, she has both extensive training and experience to bring you a cutting edge, evidence-based course. As a mom of 2, she knows personally what it takes to fully recover from having a baby. Her passion lies in helping women be stronger after baby. She is the creator of several wildly successful online postpartum recovery programs and currently works with women all over the world. She feels strongly that becoming a mother should not rob women of their ability to live life to the fullest. Along with being a wife and mom, she is also an adventure sports athlete and enjoys rock climbing, kiteboarding and any sport that tests her physical and mental capabilities. What are the best screening questions to ask postpartum women on the first appointment and on follow-ups? What are signs to look for that tell us something is wrong even if they don’t come right out and say it? Can we prevent hernias, diastasis and pelvic floor issues? Which recovery time frames matter and which don’t? When is it safe to start impact activities like running? What’s the best exercise progression from delivery to full recovery? What’s the best way to lift, carry and hold a baby? What are some precautions for baby wearing? How can a new mom incorporate more functional movement to speed up recovery? What are the best breastfeeding positions to provide neck and back relief? Functional Anatomy Review: A closer look at the muscles we’ll be asking to function. What is prolapse and how does it feel? What is a diastasis and learn how to check for it? How does the diaphragm, pelvic floor, core interact and how does this interaction affect the entire body? How does stress affect overall healing and function and what can we do to control it? What postpartum considerations do we need for the core and diaphragm? What is pressure management in the core mean? Common problems with pressure, including hernias, pelvic floor issues, and reflux. What does correct breathing actually look like? What are the best exercises to get someone breathing correctly? What’s an easy way to do self-rib mobility to promote correct breathing? Breathing case studies to see incorrect patterns on multiple people. What negative posture adaptations does pregnancy cause? Are postpartum women in an APT or PPT? What muscles become lengthened and weak during pregnancy and which ones become tight and overused? What’s the best way to quickly regain resting tone in the core to promote good posture? Do we need pressure in the core for maintaining good posture? Too much too little? Why is drawing in your belly button a bad cue? What are the best exercises to fix those adaptations from pregnancy? What are some simple cues to make effective posture changes happen fast? How does the pelvic floor actually work? What’s the difference between hypotonic vs hypertonic pelvic floor muscle and how to influence both through exercise? Prolapse and lifting: what’s helpful and what’s harmful? How does prolapse considerations change at different stages of healing? What are the best strategies to help promote prolapse healing through exercise? What’s the difference between urge incontinence and stress incontinence? How does the pelvic floor interact with the kinetic chain? How does posture affect prolapse and leaks? What are the best strategies for helping both urge and stress incontinence? How does core, hip and foot strength change pelvic floor function for better or worse? Should we have clients with pelvic floor issues wear supportive shoes or work toward barefoot training? What is the role of a diastasis in pelvic floor dysfunction? Is abdominal binding for a diastasis a good idea? What’s the best way to get the pelvic floor ready for impact, HIIT training and heavy lifting? What’s the best way to regain core strength without increasing pressure on the pelvic floor? Review pelvic floor case studies on pressure manangement and exercise progression. Review pelvic floor case studies on incontinence. Can you heal a diastasis? Should you tape for a diastasis? Learn how to tape to support a diastasis. What exercises are unsafe and can make a diastasis worse? What’s the best way to teach ribcage and pelvic alignment for healing? Do you need different exercises to address a diastasis that’s more severe above or below the belly button? What are the best exercises for addressing an upper vs lower DR severity? What is the SI and why does it give postpartum women issues? What are the best SI Joint stabilizing exercises? Understand the why behind the surrounding muscle imbalances in the pelvis. Learn the relationship between these muscle imbalances and SI pain. Understand the relationship between the Glutes VS Psoas VS TFL. Understand what causes Low Back Pain and Discomfort in postpartum women. What are the best strategies for moving, bending and lifting to prevent pain? Why do some women get pain with a hip hinge or reaching into a crib and what’s the best way to eliminate this pain? Why are overall muscle strength and balance important for back pain? What exercises best help build this overall system? Review case studies on the low back and SI joint. Why is foot strength important? Should everyone work toward barefoot training or is arch support important? Why is neck alignment important? What are the best exercises to help support great neck alignment? What are the best nutritional strategies to help promote fascial healing and recovery? What are some easy ways to market yourself to get new postpartum clients? What’s the easiest way to grow a business attracting new postpartum clientele? What are the best strengthening exercises with consideration of the pelvic floor and diastasis to get back to running without worry? What’s the best way to safely progress these exercises for fast success? I found Sarah a few years ago and what sold me is that I could tell she was different than most other people on the web touting fixes for various female issues. She wasn’t selling gimmicks or quick fixes, she was the real deal, an educator who truly cares about the women who need help. I am a fitness instructor with over 15 years of experience. I have owned my own studio for 10 years and I have now had Sarah out to my studio to give lectures on several occasions – some for instructors and others for students and she never disappoints. I happen to be lucky enough to be on the East Coast and have also been able to see her privately. She is smart, caring and most importantly, THE REAL DEAL…. she knows her stuff! I have always been the fitness person who asks why, always wanting more information and never accepting things just because. I was willing to do the work to learn more and I am so grateful that I came across her path because I have learned so much about my body and am a better trainer because of her influence. Thank you Sarah!!!! Sarah is very organized and informative. Her research is thoroughly and critically examined. I appreciated her corrective exercises and learned much about my own body. Her approach to exercise and movement will change the industry. Sarah has incredible knowledge, experience, and enthusiasm, as well as a great desire to help others learn to best care for clients. In Pilates, we always cue the pelvic floor, but we don’t talk about how to integrate it with full body dynamic movement. This workshop was extremely helpful in explaining how to do that. Having taught movement for over fifteen years, I am amazed at how much I always learn from Sarah. She is by far my favorite anatomy workshop facilitator. After this workshop specifically, I am breathing in a more full and grounded way and feel more attuned to my pelvic floor and diaphragm. I love the Eastern Medicine Philosophy in Sarah’s pelvic floor class and how she shows the interconnections between every part of the body. Fun, dynamic lessons on how to move your body in safe, smart ways and how to improve your knowledge of the pelvic floor and ability to transfer to clients more efficiently. I really appreciated the hands on demonstrations, which were soundly and effectively presented through research studies and science. I learned a lot! I love Sarah’s clinical study turned practical application approach. She breaks down scientific jargon into client related issues and exercises. Plus her hands on approach effectively cues clients toward quick physical goals. Sarah is very easy to understand. She breaks down difficult concepts into easy to digest parts. Lots of food for thought after her class! Sarah’s Pelvic Floor Class is functional, dynamic and integrates the whole body, truly connecting the pelvic floor, diaphragm, and deep core. This 12 week course dives deeper into what it takes for complete postpartum recovery. Leave with an in depth understanding of pelvic floor dysfunction, diastasis, SI joint pain and back pain. This 12-week course dives deeper into what it takes for complete postpartum recovery. Leave with an in-depth understanding of pelvic floor dysfunction, diastasis, SI joint pain and back pain.